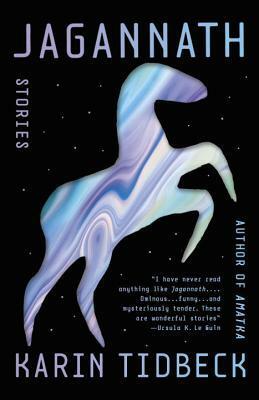 Jagannath by Karin Tidbeck is a very highly recommended collection of thirteen short stories from the Swedish author. This excellent short story collection consists of literary science fiction, speculative fiction, and fantasy. This is Tidbeck's first full length collection of stories. The quality of the writing is exceptional in this fine collection, but, as with any short story collection, readers will like and connect to some stories more than others. While Jagannath is a quick read, I predict it will captivate your attention. You may be resolved, as I am, to reread and carefully contemplate several of the stories. Beatrice: Franz Hiller fell in love with an airship while Anna Goldberg fell in love with a steam engine. The two end up sharing a warehouse. Some Letters for Ove Lindström: An estranged adult daughter writes letters to her deceased father. Miss Nyberg and I: A story of the realtionship between an artist and a small wood-like creature named Brown. Rebecka: Rebecka’s only friend, Sarah, cleans up after her many suicide attempts. Herr Cederberg: Herr Cederberg builds a machine he names "Bumblebee." Who Is Arvid Pekon? : The titular character is an operator at a governmental agency, ready to take calls, but losing himself. Brita’s Holiday Village: A woman rents a cottage on the edge of Aunt Brita’s holiday village, in the area reserved for relatives. Reindeer Mountain: Sisters and rivals, Cilla and Sara, return with their mother to their ancestral home located by the Vittra, strange elflike beings who may be their ancestors. Cloudberry Jam: A child is made/created in a tin can. Pyret: A research paper on small mysterious creatures call Pyret, Swedish for "the little tyke," who live in the countryside. Augusta Prima: Augusta is invited to play a croquet game in Mnemosyne’s court in a timeless, horrifying dream-like world. Aunts: In the same horrific world as the previous story, where "time is a weak and occasional phenomenon. Unless someone claims time to pass, it might not, or does so only partly; events curl in on themselves to form spirals and circles." Jagannath: A society of symbiotes are born and live inside their "mother."